Jane Fonda’s recent public statements in Vancouver, against the Canadian oil sands, are disputed by Friends of Science Society, citing reports by major scientific research organizations that contradict her statements. Friends of Science Society say there is also a kind of trade war in the guise of climate change concerns on-going against Canada, as there is an anti-oil sands campaign collaboration funded by offshore foundations. Syncrude: Co-managed with the Fort McKay First Nation, the Beaver Creek Wood Bison Ranch has helped to assess the viability and impact of large mammals on reclaimed land. Friends of Science Society express concern at Jane Fonda's recent pejorative statements on health impacts of development in the Alberta Oil Sands and climate change, as reported in the Vancouver Observer on June 12, 2015. 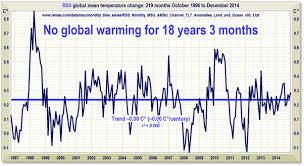 Friends of Science Society says that Fonda's health claims have been debunked by the Royal Society of Canada report, the American Cancer Society’s research, Alberta Health Services studies; her climate change statements are challenged by the evidence of continuing temperature stagnation of over 18 years despite a rise in carbon dioxide, by atmospheric experts like Richard Lindzen. Regarding Fonda’s reported statement “…causing unbelievable health problems to people who live, for example, near the tar sands…” Friends of Science suggest the public should review expert evidence and be aware that an offshore-funded, eco-group collaboration is trying to shut down the oil sands, as reported comprehensively in the magazine Alberta Oil on July 02, 2014, and also openly stated on page 47 of the 9th Annual Conference Report of the International Funders of Indigenous People. Dr. Steve Hrudey, an expert in environmental toxicology, and member of the Royal Society of Canada’s review of health claims about the oil sands, testified to the Standing Senate Committee on Energy, Environment and Resources years ago on Nov. 30, 2011, that there is no evidence to support claims of a connection between the health of downstream communities and oil sands operations hundreds of miles away. Also debunked in the RSC Dec. 15, 2010 report were the claims of higher cancer rates in aboriginal people living downstream, disputed by an Alberta Health Services (AHS) study. No cancers were found in children where evidence of environmental toxins typically first appear. Numerous graphs in the RSC report, from pages 201 to 215, show extremely elevated precursors for cancers in adults were found in the Northern Lights region including genetic factors like diabetes and lupus and behavioural factors like substance abuse, obesity, poor nutrition, and smoking. The American Cancer Society on page 7 of its “Bile Duct Cancer” information sheet explains that this rare form of cancer, widely reported by a Dr. O’Connor, to be prominent in Fort Chipewyan, an aboriginal community downstream of the oil sands, is known to be more predominant in the ethnic demographic of Native Americans. The Royal Society of Canada report in footnote 21 on page numbered 230 details why O’Connor was upbraided by the College of Physicians and Surgeons of Alberta for “making a number of false and inaccurate claims” causing undue public alarm and then not cooperating with the release of patient data for review. Ultimately, only two of his reported cases turned out to be cholangiocarcinoma, the others had been misdiagnosed. Since 1997, oil sands regional air and water have been extensively monitored. Wood Buffalo Environmental Association monitors and reports in real time, on-line the regional air quality 24/7 and 365 days a year. Friends of Science Society also challenge Fonda’s climate change comments. Professor emeritus of atmospheric sciences at MIT, Richard Lindzen, says in this March 4, 2015 report in the Wall Street Journal. that the stagnation in global warming shows an "essentially harmless climate response to increased atmospheric carbon dioxide." Friends of Science Society has spent a decade reviewing a broad spectrum of literature on climate change and have concluded the sun is the main driver of climate change, not carbon dioxide (CO2). The core group of the Friends of Science is made up of a growing group of Earth, atmospheric, astrophysical scientists and engineers who volunteer their time and resources to educate the public. 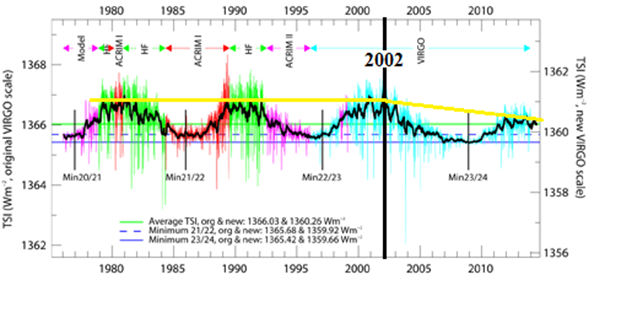 World Radiation Centre- Total Solar IrradianceTSI graphs - the trend line changing from flat to decreasing since 2002.